Heat oven to 350 F. Line a 9x13-inch pan with aluminum foil, leaving an overhang on the two shorter sides. Grease the foil with butter or cooking spray and set aside. In a medium bowl, whisk together the flour, graham cracker crumbs, baking powder and salt. In a separate large bowl, beat together the butter and sugars until light and fluffy with electric mixer, about 1 minute. Add in the eggs, one at a time, scraping down the sides as needed. Add the vanilla and beat until combined. Add the flour mixture into the wet ingredients and beat until combined. Evenly press half the dough into the bottom of the prepared pan. Drop the marshmallow creme by spoonfuls onto the dough and spread into an even layer. Layer Hershey’s chocolate bars. Note: I broke the chocolate bars into the little rectangles and randomly scattered them on top of the marshmallow creme. Drop the remaining cookie dough onto the surface in clumps, then flatten them slightly. 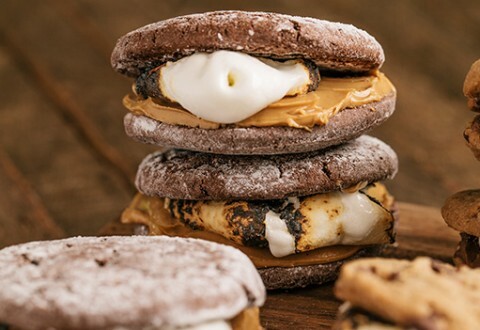 You don’t need to worry about smoothing the dough over the entire surface, as there will be some open areas where the chocolate and marshmallow are exposed. Top with chocolate chips, lightly pressing them into the dough. Bake the bars for 30-35 minutes, or until golden-brown. Let them cool in the pan completely, then lift them out by the foil and slice into squares. Enjoy!